Microscope cameras available on the market today can be connected to the computer over a Universal Serial Bus (USB) port. Many of them use the USB 2 standard. Modern computers increasingly come with USB 3 ports, which are up to 8 times faster then USB 2. 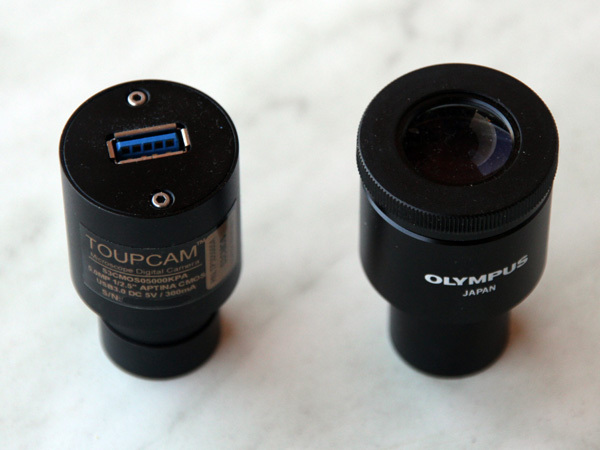 Some manufacturers have caught up with this trend and are now also offering USB 3 capable microscope cameras. You need both a USB 3 capable camera and a USB 3 port to benefit from the high speed. The high transfer speed of USB 3 now allows for the capturing of full HD video (1920 x 1080 pixels) at a frame rate even faster than 25 frames per second. A high frame rate is important for a smooth video, and slower USB 2 cameras only provided a high frame rate if the resolution was lower. This is a trade off, and one can not have both. One other option for obtaining full HD videos at high frame rates is to somehow connect a video-capable digital SLR camera to the microscope. In this case there is no need for a computer connection and the video is recorded directly onto the camera’s memory. This often requires much space and a dedicated adapter for the SLR camera, a special photo projection ocular, and therefore might also be expensive. I have been using my USB 2 microscope camera (3.2 megapixels) for several years now and thought that it is time for an upgrade. Most USB 3 cameras are extremely expensive, but I was lucky enough to find an affordable one by the company Touptek. 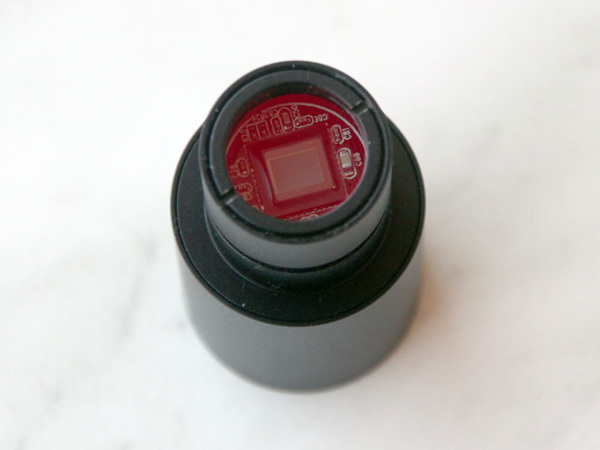 The Toupcam S3CMOS 05000KPA is a 5 megapixel camera with a 1 / 2.5 inch sensor. The small size of the camera is the most striking feature from the outside. It is about the size of an eyepiece. A closer inspection revealed, however, yet another surprising feature, one that can not be found in many other USB microscope cameras: the S3CMOS does not have any reduction optics! The image is projected directly from the objective onto the sensor. There is a protective glass plate in front of the sensor for sure (which might also act as a filter), but there are no lenses. Other microscope cameras contain reduction lenses that increase the field of view of the camera, and reducing the magnification. These reduction lenses also project the image to the camera sensor, which is located further aft inside the camera body. This reduces the need of refocusing. The lack of a reduction optics therefore made me initially a bit suspicious. I was concerned that the field of view of the camera would be too narrow, capturing only a very small part from the center field of view and also that the image that I would see through the eyepiece and the camera would be of different focus. I then saw, that the company solved this issue quite elegantly. The camera’s sensor is located quite far forward, making reduction optics obsolete. 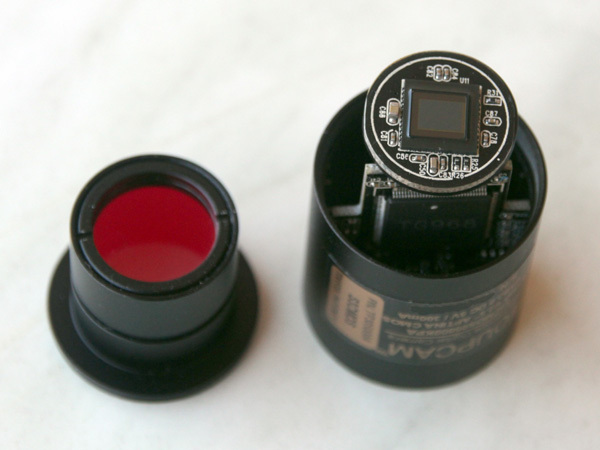 As a matter of fact, the sensor can be found in the barrel of the camera that is inserted into the tube of the microscope, and not inside the main camera body. When the camera is inserted, the sensor ends up inside the tube of the microscope. The forward location of the sensor reduces the sensor to objective distance, and the camera picks up the intermediate image (which is produced by the objective) there where a regular eyepiece would pick it up. The advantage is, that there is little to no refocusing needed when switching between camera and visual observation. Other USB cameras have the sensor further backwards inside the camera’s body. These require additional reduction optics in front of the sensor in order to prevent the requirement for refocusing. The lack of a reduction optics also has another advantage. Fewer glass elements in the light path means higher contrast and less reflections. Reduction optics might also introduce some lens errors. The image quality therefore depends entirely on the image quality produced by the objective. We do not have to worry if the reduction optics “cooperates” well with the objective, because there isn’t any lenses after the objective that light has to pass through. There is one disadvantage, though. The field of view of the camera is indeed significantly smaller than the field of view of my older USB 2 camera, which did have reduction optics and also a larger sensor, which was able to capture a larger part of the image. This is not a big issue though, maybe a question of taste, as you can always switch to a lower magnification if you need to see a larger area of the specimen. I wondered why the company did not choose a larger sensor to increase the field of view. A larger sensor would also have reduced reduced noise. An answer may be found when looking at the camera from below: Having to move the sensor into the barrel of the camera results in space problems, and I think that this might be one reason why a larger sensor was not chosen. Having said that, noise is generally not an issue, as the microscope light is quite bright anyway. The camera does not have a C-mount, and therefore it is not possible to attach reduction optics. The Touptek website does state that it is possible to convert the camera to C-mount. You need a so-called “C-mount adapter housing”, which looks like a tube that you slip over the barrel of the camera. With this adapter I can then connect the reduction optics of my old camera. The small field of view, while less convenient for observation, also advantages, however. Because only a small part from the center of the field of view is captured, the image is relatively “flat” and there is no distortion or blurriness at the sides of the image. Non-plan objectives sometimes produce a bad image quality at the sides but these areas are not captured by the small field of view of the camera. This might become important when stitching images together. The software simply has an easier time to process images that do not show distortions at the corners. If you need to capture a larger image area, simply use an objective with a lower magnification. The USB 3 ports and drivers of my computer gave me quite a bit of a headache at the beginning. Even though I connected the camera to a USB 3 port (with the appropriate USB 3 cable), the camera would still only operate at USB 2 speed. The frame rate, is indicated in the software Toupview and it was really slow at the beginning (around 2 frames per second at maximum 5 megapixel resolution). Sometimes Windows gave a message, that the device is capable of operating at a higher speed. I had to do several things to resolve this problem. I did a BIOS upgrade, re-installed Windows 10 completely (which was probably not necessary, but I wanted to play safe) and turned off the energy-saving feature of the USB 3 ports. Last, I updated all USB drivers. As this also did not resolve the issue, I deactivated USB 2 in the BIOS and this forced the camera to work in USB 3. It took me some Internet research to figure this out, however, and I mention this now in case some of the readers experience similar problems. Sometimes unplugging the camera and then re-plugging it also works. USB 3 ports on notebook computers apparently are not as fast as those of desktop PCs, so this is also something that you might take into consideration. Last, the frame rate that the camera produces depends also on the shutter speed being used and if the computer is busy with other things. The Touptek website also includes information how to deal with related USB connection issues. The USB 3 problems are generally not even that uncommon. I read, that some computer hardware manufacturers, evidently, do not fully stick to the specified USB 3 standard. More modern computer motherboards might operate more reliably with the camera than my current one, which is already several years old. The camera has a very fast shutter speed (0.122ms). This makes stitching images together very convenient. When stitching images together, one has to (traditionally) take overlapping pictures, which are then assembled into one final image. The free software MS-ICE also accepts videos to make a panorama. I took a video of a specimen by filming all parts. Using the mechanical stage of the microscope, I “rastered” the whole specimen. The fast shutter speed makes it possible to move the slide without introducing motion blur during the filming. It was therefore possible to film the specimen much faster than with my old USB 2 camera. The program MS-ICE extracted individual images and assembled them into a final stitched picture. The calculation time took quite long, but the filming was completed in the fraction of a time that it normally would have taken to make overlapping images. The results that I got were also better than the results that I got with my old USB 2 camera. The smaller field of view (due to the lack of reduction optics) eliminated distortions at the side of the pictures, and as a consequence the final stitched image was also not distorted. At this point it should also be mentioned, that the software Toupview also allows you to easily stitch overlapping images together. The small field of view can therefore be easily compensated by the software. Particularly interesting is the 1280×720 resolution with about 50 frames per second. This would allow for the filming of fast movement (cilia of paramecia, etc). USB 3: fast speed for full HD video at full frame rate. The fast speed does not produce delays or a slurred image for visual observation on screen. This makes it possible to display a high resolution image live on screen. Low cost, in relation to other USB 3 cameras. Very small and light, so that it can be connected to a microscope instead of an eyepiece (no need for a trinocular head). Not much refocusing needed: When you see a sharp image through the eyepiece, then you also see a sharp image on the computer screen. Very short exposure time: The Toupview software indicated a minimum exposure time of 0.122 ms (adjustable up to 8 seconds). This is really able to freeze fast movement. No reduction optics means fewer lens errors. The sensor picks up the image directly from the objective. Image quality high at the corners. No reduction optics means that only a small part of the center is captured by the sensor, and this excludes the distortions and blurriness that are otherwise common on the side of the image. Please note that I am not affiliated with the company.